A majority of off grid amateur radio involves portable operation with small systems. There are many reasons for this: Many people cannot afford large scale fixed solar; some are held back by homeowner association rules or want to incorporate amateur radio with camping & hiking activities. Other amateurs are motivated by disaster or SHTF preparedness. The “holy grail” goal for all these groups is to refine their radio setups so they can be carried a relatively long distance by one person. Just how small and light can you get and still have a practical, portable off grid radio station? I did a little investigating and found out for myself. If someone out there has found a way to operate high power (100 watt) portable off grid radio in a format that fits the above specifications, please let the rest of the world know. I’ve seen many blogs and videos of people who have tried. Only one came sort-of close, and he used a $1200 ultra light folding solar panel and a $1100 lithium battery to pull it off. Even then, calling that setup “carry portable” required a bright imagination and/or the physical abilities of an Olympic gold medalist. While these attempts at high power portable are well done for what they are and do technically work, none of them are inclusively practical and small and light enough to strap to your back and walk for a few miles. The only way around this huge roadblock is to go with a QRP-specific radio, which means we can also scale down the batteries and charging source. A lot of amateurs are resistant to QRP. They think it’s not worthwhile or that it just doesn’t work, or simply never gave it a chance. If you are one of these amateurs, I urge you to reconsider because without QRP, you are limiting yourself to a very small number of not very good options. Not everything on this list will be taken along as some items are mutually exclusive. For example, if I bring the dipole, then I don’t need the long wire antenna, or the unun, or for that matter the antenna tuner. The total also does not include the weight of whatever I’m carrying my stuff in, or non-radio related gear. Suppose I go with the radio, the long wire antenna (which requires the tuner and unun), the battery, the 27 watt solar panel, the rubber antenna, and the coax. All that stuff clocks in around 15 pounds. That’s a lot to lug around. Where can we cut the bulk? Hmmm, well, do we really need all 50 feet of coax? We could reduce that to 25 feet and save about a pound. Most of the weight of the antenna tuner is in the batteries. We could get a manual tuner and reduce the weight of that item by more than half. We could also drop the long wire antenna altogether and take the dipole, which is made from thin 22 gauge twisted pair wire. That would eliminate the need for the antenna tuner and the unun. The disadvantage is that we’ll need a separate dipole for each band we want to use. Still, two or even three dipoles weigh less than the long wire and associated hardware. A really ambitious operator could make a multiband dipole that uses only one balun. Depending on how you work it, a dipole will knock about another 1-2 pounds off the total of our portable off grid radio station. The solar panel: At over two and half pounds, the 27 watt solar panel is kind of chunky. We can go with a ten watt panel which is a 75% weight loss. Again, there is a tradeoff, namely, not as much solar power for recharging batteries. Let’s talk about that battery. It’s the single heaviest item in the portable off grid radio package. What can we do about that? One option is to eliminate it altogether and run from the internal battery on the radio. When the FT817 is on internal battery, the transmit power will be reduced from 5 to 2.5 watts. Another possibility is to replace the large AGM battery with eight AA rechargeable batteries in a holder like this one. Eight AA batteries offer just under 2 amp hours at 12 volts, so you’re giving up more than half of your external battery capacity but are shaving over three pounds from your setup. If you read my recent article about calculating how much battery is needed, you’ll know that you’ll have to keep your duty cycle light if you plan on using the ten watt panel with the 8xAA batteries. The panel alone will not fill the battery faster than the FT-817 drains it. When it comes to cutting back on solar and batteries, you have to place your bets: Either commit to carrying more pounds or go easy on the transmit and hope for a really sunny day. How is our portable off grid radio station doing on this diet? The radio, the 10 watt solar panel, dipole, 25 feet of coax, the rubber antenna for VHF/UHF, 8xAA batteries, and allowing a little extra for assorted cords and cables weigh in at eight pounds. Wow! That’s almost half of the 15 pounds we started with and we haven’t made any deal-breaking compromises! We’ll need something to carry our portable off grid radio station in. It’s not as simple as it sounds. From my long ago experience as a Boy Scout, a poorly chosen backpack will have you in pain very quickly, even if it’s just a short hike. I’m not an authority on backpacks, but I know someone who is. Mike, KE0GZT, runs the superb Backcountry Journal blog about hiking and camping, and he was kind enough to coordinate with me and write an article specifically for Off Grid Ham readers about the different types of backpacks as they relate to portable off grid radio, including links to additional information. I’m giving Off Grid Ham readers a homework assignment: Read the Backcountry Journal article, ask Mike questions as needed, and do your due diligence before you trot down to Walmart and just grab whatever’s on sale. Click here for Mike’s great radio backpack article, and while you’re there, subscribe to his blog (it’s free). He has a lot of worthwhile insight that would be of interest to off grid amateurs. Finally, once you have everything assembled, get out there and try it. Fill that backpack (or whatever you settled on) with all your portable off grid radio gear and go on nice long walk. Find out where the weak points are. Adjust and make changes before you find yourself in a situation that really matters. 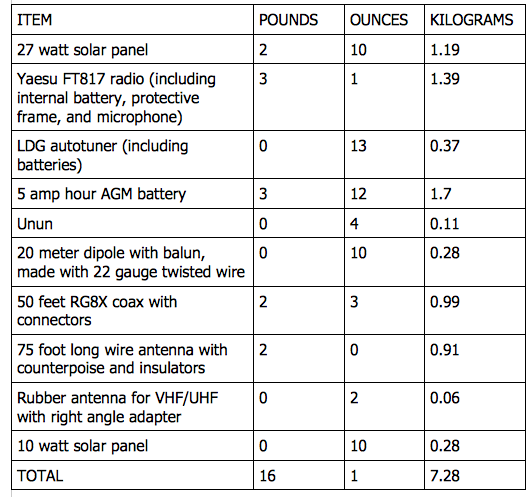 We know it’s important to weigh all the equipment you are considering for your portable off grid radio station. Get accurate, real numbers. Do not guess. We talked about reducing weight without giving up too much functionality. Consider how much of your equipment you really need. Where can you make cutbacks and substitutions? We understand the importance of choosing the right backpack to carry our equipment. KE0GZT’s article provides additional guidance in this area. This is great . I love these kind of challenges. What is the time frame for this build. I will have to start from scratch with all new equipment or something because the rest of my stuff is already mounted in a go box. But it’s not in a small package like you’re talking about. I’ll be posting this link to your blog on my side if you don’t mind, that way some of the others may come and check it out . Hi Drago, the time frame is whatever you want it to be. This project could be completed in an afternoon if you already have the stuff needed to put it together. The larger go boxes are cool and have a lot more functionality than this lightweight version, but you give up a lot of portability. There is no right or wrong, it’s all a matter of what you are willing to give up for some other benefit. 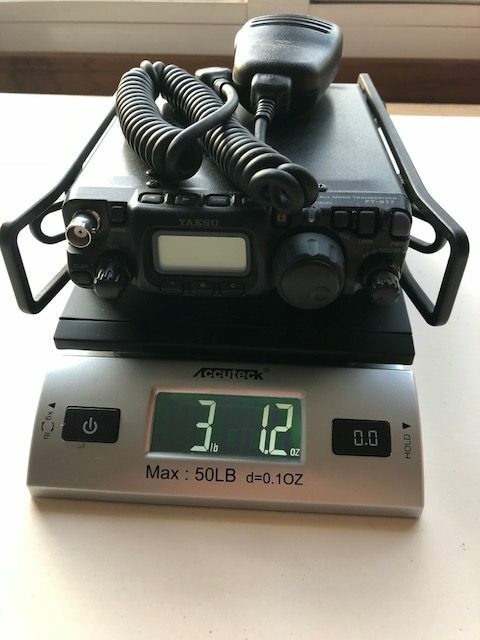 I got the idea for this article from a reader who observed (correctly) that most of the blogs and videos on this topic focused on larger “boxes” and there wasn’t a lot of anything about lightweight “carry portable” stations. As for reposting on other blogs, social media, club newsletters, etc., I not only approve, I actually encourage it. All I ask is that proper attribution be made and that you include a link back to the original article. Good luck with your project. Let us know how it comes out. You might consider rg-174. Belden specs 3.3db / 100 ft @ 10 mhz or about 3/4 db for 25 feet. Didn’t find weight in a quick google search at 11pm (past bedtime for me) but if you have worked with it, you know it is much smaller and lighter than 8x, and can certainly handle the QRP. Hi Robert, you are right, a smaller coax is an effective way to cut down on weight. I had planned a discussion about this in my article but that topic did not make the final cut. Thinner coax will have a lot of loss but this is offset by keeping the run short. For more information about coax cable and the effects of loss, check out this Off Grid Ham article from April, 2016. … I love operating QRP from here at home (back in Feb. I worked Tasmania with 20 watts, not QRP technically, but still, 20 watts? Most fun I’ve had in ages), but haven’t put together a portable rig yet to take out in a backpack, mostly because of sheer laziness, I must confess. But I do spend a lot of time out on a bicycle, biking around the countryside, and I keep telling myself I need to put together a little QRP HF rig I can toss in a backpack just to see what I can do with it. So I’m finally going to set everything up this winter so I’m ready when the weather gets good enough to get out on the bike in the spring. I was looking at some of the ultra-portable QRP transceivers but I’m going to get the FT817 (or the newer version that came out fairly recently). It can do everything I could ever possibly want to do, is compact, fairly light weight and could be easily used with digital modes. I don’t need a charging set up because I rarely go more than 20-30 miles on the bike. And I already have a buddie pole type antenna laying around here somewhere that is left over from my days with ARES which breaks down far enough that I can pack it. — And then the silly part of my brain kicked in and I started thinking that with hams “activating” everything from summits, (Summits on the air), islands on the air, even (seriously) Walmart parking lots on the air, why not do something like, oh, Manure Pits of Wisconsin on the Air? Or Abandoned Barns On The Air, or Mosquito Infested Swamps On The Air and print off 8X10 photos of the location I’m operating from with contact details as an “award” for people who contact me. I mean, who wouldn’t want an 8×10 photo of a grouchy old farmer operating QRP alongside a manure pit, or frantically swatting mosquitoes while trying to call CQ on 20 meters? I always get a kick hearing from you, Randall. Let us know when you go on the air from the manure pit. I want to be your first “customer”. or ladderline much lighter tham coax,very little loss,one wire for all bands with a tuner. There are tons of antenna possibilities out there and I could not cover them all in one article. Thanks for the tip, Dale. Very cool idea. Portable ops are something I want to work towards. Hi Mike, good luck on your portable operations goals. I hope Off Grid Ham has been helpful.